These easy-to-make Mini Vegan Gluten-Free Pumpkin Muffins are the perfect treat for fall—or any other time of year. Enjoy them with a latte or on their own! I’ve finally accepted the fact that long, hot, sunny summer days are gone (for now!) and short, cool, (mostly) gloomy fall days are here (for now). This time of year always takes me some time to adjust (I’m a summer girl, through and through), but the things that make it a little easier are the return of slow cooker recipes, apple recipes, and of course, pumpkin recipes. I’m not the only one who has a hard time saying goodbye to summer, right? 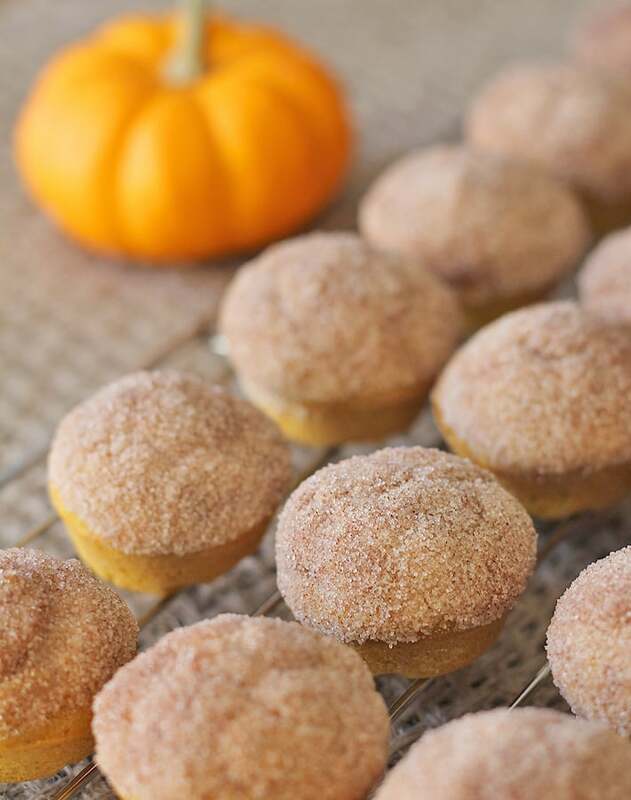 These pumpkin spice mini muffins are an adaptation of my old fashioned cake doughnut mini muffins recipe—a popular treat in my home. But now that pumpkin season is here, I thought I’d give that recipe a little autumn makeover by swapping out some ingredients for fall flavours. And what says fall flavours more than pumpkin and pumpkin spice? I can’t think of anything else. So…here we are! TIP: Skip the canned pumpkin and learn how to make homemade pumpkin puree (it’s really easy!). 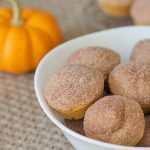 Mini vegan gluten-free pumpkin muffins are perfect for school snacks, at-home snacks (with a delicious hot drink! ), a nice food gift to say thank you to someone, or even your contribution to a get-together with friends…they’re good for any occasion, really! And the best part? No one will be able to tell that these treats are vegan or that they’re gluten-free. Try it, you’ll see! 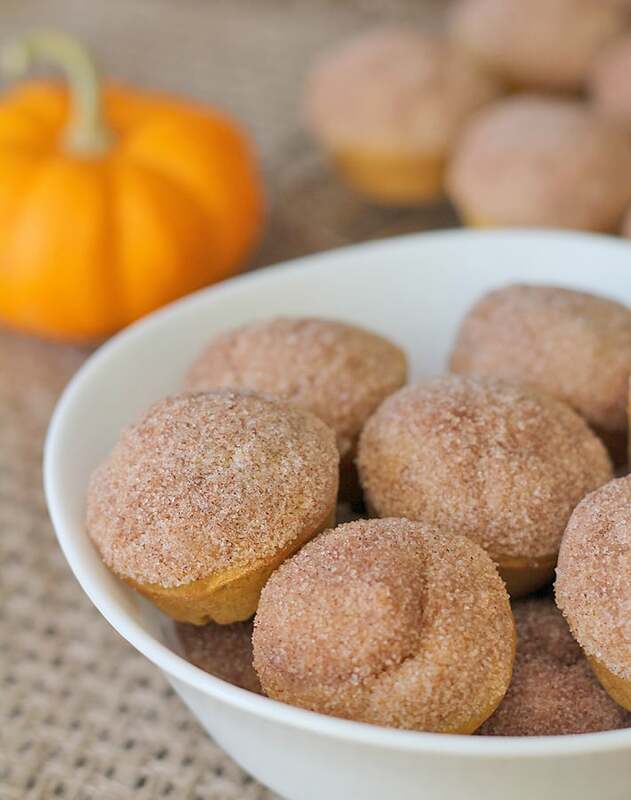 When you make your pumpkin spice mini muffins, be sure to store them in an airtight container and eat them up within 2-3 days. They’re best enjoyed when fresh. 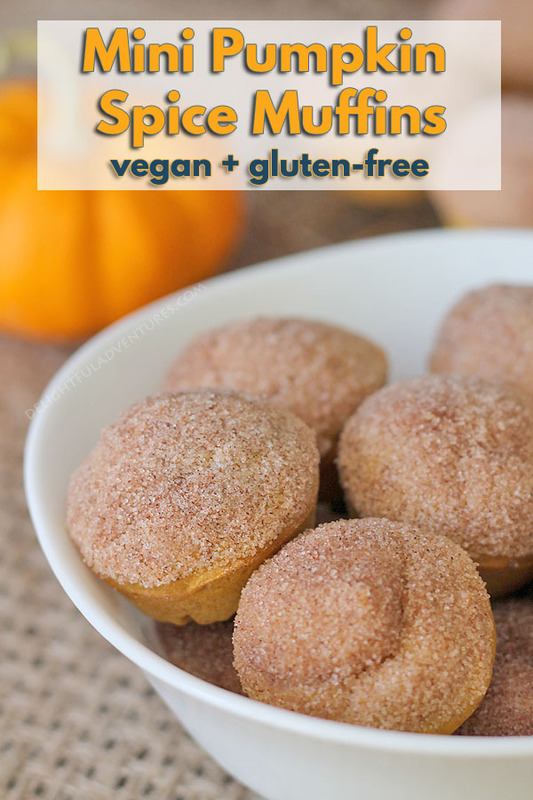 And if “mini” muffins aren’t your thing, check out my vegan gluten free pumpkin spice muffins. They’re a little different than these, but just as delicious and a bit larger! I’ve receive a few messages from a couple readers saying that this recipe did not turn out for them because the batter was very thick. The batter should not be thick or like cookie dough, it should be like a regular muffin batter. Please do not substitute the flour I recommend with coconut flour. Coconut flour is not an easy flour to work with and this recipe will not work if you use it. The only flour I’ve tested this recipe with is Bob’s Red Mill Gluten Free All Purpose Baking Flour. <– Click that link to see what it looks like. You can buy it through that Amazon link or look for it at your store. Don’t use the Bob’s gluten-free flour with the blue label, it does not work the same as this one. If this specific flour is not used, your results may not be the same as mine. Note that the non-dairy milk and pumpkin puree call for 1/2 cup (milk) and 1/4 cup (puree) PLUS 2 tbsp. Please don’t miss those extra 2 tablespoons of each ingredient, or your recipe will not work. Be sure that all ingredients are measured correctly. Okay! So now that those tips are out of the way, it’s time to get baking! Enjoy! And I’d love for you to subscribe to my newsletter so you can keep up with all the latest recipes. Click here to subscribe. These mini vegan, gluten free pumpkin muffins are the perfect treat for fall—or any other time of year. Enjoy them with a latte or on their own! 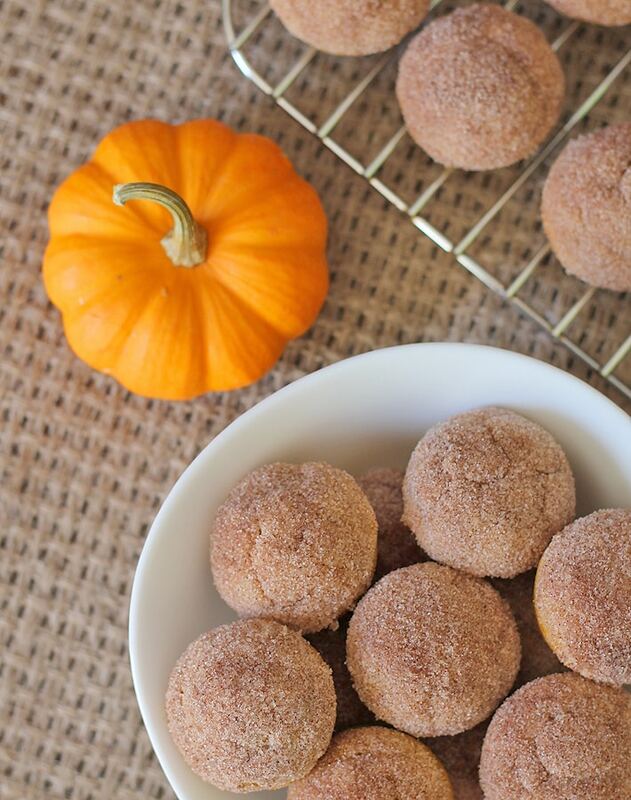 In a large bowl, whisk the flour, baking powder, salt, sugar, and pumpkin spice. In a small bowl, mix the melted coconut oil, non-dairy milk, pumpkin puree, and vanilla together. Divide batter evenly between the 24 muffins cups. Bake for 8-10 minutes (until a tester comes out clean from the largest muffin). While muffins are baking, put melted coconut oil in a small bowl and mix the sugar and cinnamon in another bowl. Remove muffins from oven and cool for 10 minutes in tin. Remove muffins from tin and place on a cooling rack. While still warm, dip 1 muffin at a time into the oil first. Make sure the entire top is coated with the oil, shake off any excess. Then dip the same muffin into the sugar/cinnamon mixture, ensuring that the entire top is covered with the cinnamon sugar mix. Place muffin back on cooling rack. Repeat with entire batch until done. PLEASE read the "Before Making This Recipe" section above, before starting. It's important to know that different gluten-free flour blends use different ingredients and ratios, so results will always vary if you substitute. I have never used any other flour to make this recipe (other than Bob's Red Mill Gluten-Free All-Purpose Baking Flour (the one in with the red label in that link, not the blue label! ), so please know that your results may not be the same as mine if you substitute with a different blend. Have a look at the batter in this similar recipe to get an idea. If you use the flour recommended in this recipe and follow the recipe exactly as it is written, your recipe will work perfectly. Store uneaten muffins in an airtight container in the fridge for up to 2-3 days. The longer they sit, the more the cinnamon sugar on top will melt, so it's best to eat them as quickly as possible. Nutrition info listed below is for 1 of 24 muffins and is only to be used as a rough guide. Click here for more info on how nutrition info on this website is determined. How well do these freeze without the topping and then add toppings later? Hi Amber! I haven’t put them in the freezer so I can’t answer with 100% certainty but I think they will be fine. Keep that in mind that because they have coconut oil in them, they will need to be room temperature to be soft once again. I hope you like the recipe! Hi Atina, curious as to why you would use eggs in this recipe? It does not call for eggs at all, so that is likely why the recipe did not work. What a great recipe! Worth trying it! Thanks, Claudia! it’s hard to pick favourites, but of all my recipes, this is definitely one of them. If you try, I hope you like them! Hi:) these are amazing!!! Making them for my daughter’s classroom birthday celebration! I would like to make them the day before.. Do you know best way to store these? Airtight container in fridge or room temperature? Thanks!! Hi Alexandra! I would store them in the fridge in an airtight container so the sugar topping doesn’t get wet. BUT, take them out in the morning well before the kids are going to have them. Because there is coconut oil in the recipe, it will make the muffins get hard but they will soften up as they come back to room temperature. This is what I do. I hope that helps! Let me know if you have other questions. I hope everyone loves them! Is there a substitute for the coconut oil? I’m allergic to coconut and can’t have it. Hi Paula, any oil that you usually use for your baking will work fine. I would stay away from olive oil though since it may affect the taste. If you do make them, I hope you love them! These look delicious. I notice that your other muffin recipes include flax eggs, but this one doesn’t. Is that correct? Just wanted to check with you before attempting it, since I’m not an experienced baker. Thanks! You’re welcome! It’s going to take me a while to get used to the gloom, despite having pumpkin spice mini muffins, but I’ll manage 🙂 Thanks for stopping by! I can not wait to make these! YAY!